Yasiel Puig can be a bit of a distraction, both on and off the field. But the Cuban import’s talent and on-field production more than makes up for his often humorous gaffes. The 23-year old is, however, going through the worst stretch of his career, slashing .195/.307/.537 over the past month. But he’s still maintained his knack for controversy, with the latest incident in the Chronicles of Yasiel having our hero arguing with Matt Kemp in the Dodgers dugout during their game against the Rockies. Speculation is Kemp was angry Puig — who is a fast runner — didn’t take third on an Adrian Gonzalez single which came right in front of Kemp’s plate appearance. The Dodgers won the game 11-3. There have been reports that the Dodgers dugout is “dysfunctional.” Mattingly responded to them be joking his team was “like the ’72 As,” who won their first of three straight World Series despite having a less than harmonious dugout. 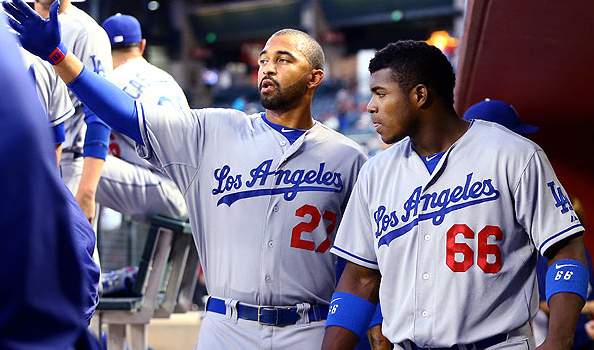 Puig’s poor play of late has some calling him to be replaced in the lineup by well-paid bench piece Andre Either, stud rookie Joc Pederson or the unheralded Scott Van Slyke, who quietly has the best numbers of any member of LA’s famously crowded outfield. So far Mattingly has been sticking with Puig, and the Wild Horse may be getting back on track; he’s 6-14 with two doubles over the last three games. If he keeps hitting, this latest dust up will blow over. He reverts to his slump, it may be more ammunition for a change, as the Dodgers battle the Nationals for home field throughout National League post season.